Wednesday, October 28 1908 -- Spoiler alert! 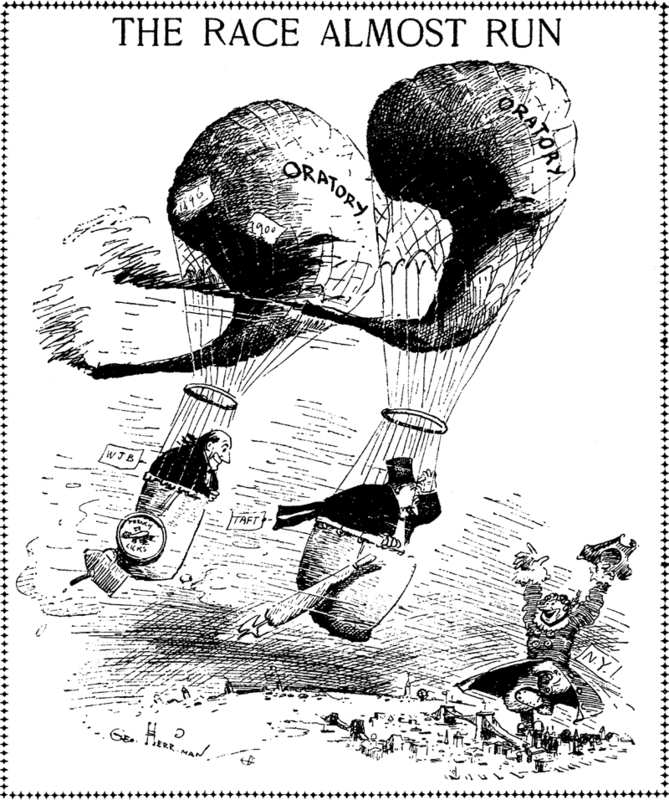 Herriman is calling the race right, Taft has enough wind behind his back to take the presidency in next week's election. I can't believe that Herriman missed the chance to have Teddy Roosevelt's mighty lungs be responsible for most of that wind behind Taft. From my earliest years my vacations had been spent at Oyster Bay, my uncle John coming to New York in his sloop to Aunt Sarah's house on the river bank at 84th Street and sailing back with a cargo of whooping youngsters to the "Creek" beside which he lived. Adventures were not lacking to these voyages, moments of terror in dread Hell Gate, sudden storms and annoying calms, occasional agonies of starvation between meals. There were wide tracts then of genuine wilderness on Long Island where quail whistled and mud-hens made noises like gear being stripped. On the oak barrens between the Creek and the Sound, through which we passed to bathe, the barefooted village boys and sons of summer residents met and made things pleasant in the informal and piquant manner of boys the world over. Teddy Roosevelt lived not far distant. He wore spectacles and, naturally, this being very unusual then, was the object of special attention from the village rednecks, being somewhat supercilious beside. He was willing to engage in combat but strictly forbidden to do so on account of the spectacles. He was an undersized, nervous, studious boy who did not often join in the rough sport that occupied most of us, but I imagine he was checked in this also. We used to tease him when he sat on his porch and made "horse-reins" on a spool. One day in New York when we were playing near the river in the back yard of a boy named Shieffelin, whom I never met in later life, Teddy discovered that I was shortsighted, although my parents and teachers were unaware of the fact. A cessation of the play had ensued when an eagle flew over high above us. I could not see the bird until Teddy offered me his spectacles, then rarely worn by youngsters. I instantly perceived the king of birds soaring far aloft, and at the same instant became aware of hundreds of details in the landscape of which I had been hitherto utterly unaware. Teddy informed me that I was nearsighted, advised me to get spectacles, and generously bestowed upon me a lens from a broken pair which he happened to have in his pocket. I well remember that next day in church this new acquisition made it possible for me to pass the time in intense enjoyment, and thus began a thralldom to opticians that endured until a recent unaccountable improvement in my eyesight occurred. Theodore Roosevelt, now already being invested with superhuman attributes, and I were always friendly and companionable, almost of the same age, both garrulous, opinionated and optimistic, and having in common a love for birds, hunting, riding, boxing and the like, but I never fathomed his passion for chopping down trees. Only for a time was our friendship disturbed; this was when he became Police Commissioner and I perpetrated the awful eyeglass-and-teeth caricatures. The one that actually enraged him was a really funny combination of a dentist's and an optician's showcase which quite curiously resembled him and of which I was secretly very proud. I soon heard that he was deeply offended, but his indignation was increased when on the day of his taking office, or that evening, a rainy, chilly night, I anticipated his projected personal inspection of the force and without disguise, but adopting a wide, toothsome grin, I, with a reporter, strolled up Sixth Avenue, dispersing every cop, visiting every station, appalling lieutenants and sergeants, and, without exciting the least suspicion, threw a general scare into every policeman I encountered, simply by dint of a few snappy questions and a broad-brimmed hat which I, as well as Roosevelt, at that time affected. That I resembled him closely enough to deceive those who had seen only his portraits was the secret of the success of this prank, the story of which when printed created some amusement and much disgust in police circles, but it made Teddy exceeding sore, and it was not until he became Governor, and State Librarian Hugh Hastings induced him to forgive me, that we entered upon our old relations. I never would have dreamed of his taking offense at such a thing, for no man knew better the value of such advertising. He had none of the false dignity of most great men—and I believe him to be actually the greatest of our Presidents. Once I happened to be bicycling in Peekskill and came upon him as he was about to lead a cavalry regiment on a hike to Albany. He invited me to accompany them, but duty compelled me to decline, and he dropped into the grass beside me on the roadside, where we discussed many unimportant matters, plucking grasses and chewing them like two boys while the troops waited. Finally, noting the perturbed glances of his staff, he recollected himself and sprang up, laughingly addressed his officers, and mounted his horse. Plainly enough, the whole staff were wondering who the dusty wheelman was who had held up the hike for an hour. I met one of them years afterward who reminded me of the incident, and he said that the Governor had told him who I was and had added: "If you ever meet him, treat him nice. He's like strong drink. He can sting like an adder!" Roosevelt rarely was offended by cartoons. When I was syndicating a series called "Teddy in Africa," he was abroad and saw but few of them, but many of his admirers took up the cudgels for him. Piatt and Depew never took offense, Penrose sometimes quivered, but Quay was mailclad. He did not care how mean or offensive were portrayals of himself, and frequently asked for and framed the originals of very scathing cartoons. Croker was touchy although he pretended always to disregard newspaper attacks. He found it difficult, I perceived, to treat me with civility when we met, as often happened. Hanna merely despised a World cartoonist as a Democratic pest, but he frothed at the mouth over Homer Davenport's pictures and used language regarding him that he must have garnered in his lumbering days. Ward McAllister once intimated that he would cane me if he ever encountered me, but when I walked up and accosted Richard Harding Davis while conversing with "the arbiter of the 400" one day, he merely pursed up his lips and hurried away. However, he did not happen to be carrying a cane that day. "He ought to be in the penitentiary!" James G. Blaine, a man of erudition and culture, as were Quay and Tom Reed, once acknowledged to me with more regret than irritation that Victor Gillam's "Tattooed Man" cartoons had made him writhe, not from rage, but from a sense of impotency against such a combination of malice and humor. He also informed me that he believed that there might be good reasons for the World's claim that the "Belshazzar's Feast" cartoon, which the Democratic State Committee enlarged to enormous size and placarded the city, had of itself influenced the election in 1884 sufficiently to account for the eleven-hundred-odd votes that lost him the State of New York. As a cartoon, I have often observed, occasionally made a difference of, say, ten thousand in the daily circulation, I have always felt that Grover Cleveland owed me a lot. As a rule the rudeness of the cartoonist goes unresented by his victims less from respect than a fear that he might do far worse, yet a cartoonist is rarely made to suffer, no matter how scurrilously he treats his subjects. I imagine that he is really regarded by most public men with much the same feeling that all have for poison ivy, but this feeling has, I must admit, been in the main carefully hidden from me. I have only caught glimpses of it. In Europe, I found, he is not given as free a hand, and in Cuba not long before the Spanish War I narrowly escaped imprisonment by General Weyler because of a few disrespectful sketches that were reprinted in a Havana paper. I was exiled and came north in mid-winter to land in a blizzard, attired in the thinnest of tropical garments, with the clothing stores all closed because it was a holiday. 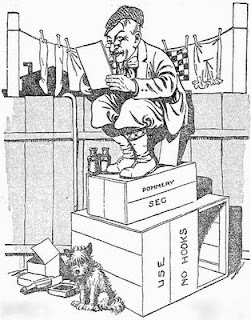 Homer Davenport had an experience that illustrated the British attitude toward the cartoonist. Homer was a breezy, somewhat illiterate, unpretentious and amiable Westerner to whom sudden fame had brought many friends and a slightly exaggerated sense of importance. At the summit of his renown, Hearst had sent him to England. The day after his arrival, he started off to Hawarden to make a life portrait of Gladstone, assuming that all British statesmen were cartoon-broken and approachable, as were the Washington species. Hearing from the lodge-keeper that the Prime Minister was engaged in chopping down trees, Homer did not approach the house, but with the Westerner's keen instinct trailed his victim to where he was making the chips fly about a large oak. He stopped beside the austere axman and regarded his efforts with friendly approval until Gladstone observed his presence and paused. Homer then introduced himself as the American's cartoonist, and was pained and embarrassed at discovering that a cartoonist was not deuce-high in that neck of woods; nevertheless, he endeavored to make conversation of a sort to put Mr. Gladstone at his ease, but the result was merely a few savage grunts. After a pause of some length, the Prime Minister resumed his chopping. Poor Homer, having no experience of such frigid treatment, was at a complete loss for any method of extricating himself from his undignified position, but seeing a number of black birds circling above the trees in the distance, he ventured upon a new subject. "I see you have a lot of crows around here," he remarked as Gladstone stopped and, standing erect, regarded him with a glance that was harder and chillier than a cold-storage turkey. "Rooks, sir, rooks!" harshly croaked the statesman as he seized his ax and strode away. Davenport's naïveté and geniality endeared him even to men who despised the paper he represented. One day Arthur Brisbane said to me just before luncheon: "I'm going to raise Davenport's salary." "You'd better try to hoist your own first," I suggested. "How are you going to do it?" "He'll be over here in a few minutes. Wait and see." When Davenport arrived, Arthur offered him a hundred dollars per week more than he was receiving on the Hearst paper. Homer was stunned, but demanded an hour in which to consider the proposition. After we returned from luncheon, Davenport telephoned to decline the offer, explaining that Hearst had gone Brisbane a hundred dollars better. This the wily Brisbane had expected when he laid the plot, but a year or so later, when he himself had deserted Pulitzer for Hearst, this imposing salary of Homer's was concentrated gall and wormwood. Finally, Homer formed a syndicate with Edward Marshall and myself, but the difficulty of finding Democratic papers wealthy enough to indulge in the luxury of his cartoons soon made the venture a precarious task and he was forced to make terms with the Hearst papers. "Greater New York? Gosh! Some job!" That was the same day he asked Fred Opper, after he had consulted a copy of "Hamlet" for local color: "Who's getting the royalties on Shakespeare's plays now?" At the present time, when every correspondence-school comic-strip, Jeff-and-Mutt imitator calls himself a "cartoonist," Davenport would have found himself among a small army of illiterates. The proud title meant at the outset—and still means—one who produces a certain type of picture designed to affect public opinion, a pictured editorial, in fact, and has at all times been confined to a limited number of men, and none of the army of strippers, except Charles Macauley, who followed me on the World, has any more right to be called such than he has to be designated a paleontologist. "Mac, we've got to hump ourselves and make all the money we can, for it's as certain as taxes that a lot of real artists, fellows who have studied abroad, will be butting into this game and we'll be in the soup!" However, in the forty years that have elapsed, one can count on his fingers the really efficient cartoonists who have been developed by the necessities of newspapers, in spite of the fact that the correspondence schools advertise that they produce them in quantity. In my years on the World and the Philadelphia North American the position was almost unique, only John McCutcheon, of the Chicago Tribune, being similarly situated, in that it was coequal with any position on the staff. Nobody dictated what I should do or how, and I sometimes practically dictated the policy of the paper by making a cartoon in advance of any editorial comment, as in the case of the Homestead Strike, when my picture sided with the strikers instead of with Carnegie, before J. P. had decided on his policy. Without any feeling, he commented on the position in which I had placed the paper, and within a day or so was pleased to say that my point of view was the correct one. With me, of course, it was merely a matter of sympathy for the workers, and not policy. I did not then know that the "policy" of the modern newspaper is usually nothing more than political or business expediency; besides being exceedingly elastic and resilient in emergencies, it can endure the severest treatment without a squeak of agony. J. P. never placed the least check upon my energies and he never uttered one word of reproof or harsh criticism during the sixteen years I was on the World, and when I recall some of the caustic comments I have overheard and read on the outbursts of passionate protest and profane impatience of his sightless years, as recorded by his biographers, I have a feeling that I was singularly fortunate. I cannot remember that in all the years of my service was a cartoon made by me that was not published. Don Seitz records that I once sent in a caricature of Col. Charles Jones's wife on the beach at Asbury Park and that it narrowly escaped being published on the very day that Jones assumed control of the editorial page. If this be true, and I cannot deny it, because I have forgotten all about the incident, it shows that I was a pampered pet. "My dear Sir, Will you kindly go to hell? "Drop that in the mail box for me," he commanded, as if to convince me that it was not a bluff, and I did so with vast satisfaction. It is also remarkable how rarely in all these years was a really serviceable cartoon suggested to me by any editor except J. P. and Cockerill. Few editors seem to think pictorially. I received suggestions from outsiders like Sydney Rosenfeld, Sam Untermeyer, Charley Hoyt, the playwright, Lew Dockstader, Thomas B. Reed, Senator Tillman, Maurice Barrymore, George Francis Train and, strange to say, from John L. Sullivan, who had a rough Irish wit that seems to have been entirely unsuspected by his acquaintances. In the minds of these men, cartoon ideas formed in actual cartoon shape. "Who was that bucko, mate? I never saw that sort here!" "That was COBB!" whispered Macauley, wiping his damp brow. "Never heard of him!" I stated truthfully, outraged by this unheard-of outrage upon that sacred cow, a Heaven-inspired cartoonist. "Whether he is plain Cobb or corn off the ear, if he'd panned me like that, I would have handed him one on the beezer, sure as Eve tempted Adam to his fall. That never happened here in my time!" Julian Ollendorff was born in Brooklyn, New York, on June 14, 1881, according to his World War II draft card. Information regarding Ollendorff’s education and art training has not been found. American Newspaper Comics (2012) said Ollendorff’s earliest comics series was Hapless Tower which ran from February 2 to April 13, 1902 in the New York Tribune. Ollendorff’s illustrations appeared in the Tribune and other papers such as the Indianapolis Journal and Evening Star. Ollendorff also illustrated stories in Leslie’s Monthly Magazine and Appleton’s Magazine. And he operated the Ollendorff School of Fashion Illustrating. On June 18, 1906, Ollendorff married Rosa Weill in Brooklyn, according to the New York, New York, Marriage Index at Ancestry.com. A Manhattan city directory’s illustrators section listed him at 24 East 21st Street, Room 907. In 1910 the couple resided in Brooklyn at 478 Throop Avenue. Ollendorff was an artist at Siegel & Cooper. A 1913 Brooklyn city directory listed Ollendorff’s residence at 478 Quincy Street and studio at 23 East 14th Street in Manhattan. Ollendorf took his family to Bermuda in 1911 and Europe in 1913. The 1913 passenger list said his daughter, Muriel, was born November 8, 1907. The 1915 New York state census recorded artist Ollendorff in Brooklyn at 478 Quincy Street, which would be his home into the 1940s. Manhattan city directories for 1916 and 1917 listed Julian Ollendorff Studios at 41 Union Square West on the twelfth floor. The same address was on his World War I draft card which he signed September 12, 1918. His description was medium height and build with blue eyes and brown hair. Ollendorff’s venture into film was reported by the Music News, June 25, 1920. Hugo Riesenfeld has arranged with Julian Ollendorff, famous painter, to stage a series of folk dances in natural color motion pictures for presentation at the Rivoli, Rialto and Criterion theaters. Mr. Ollendorff will make the sketches for the dances and then engage well known dancers to execute them for the camera. Special music will be prepared for these scenes by Mr. Ricsenfeld himself. In several instances he expects to be able to have the originals appear and dance along with the picture, as Desha did with her bubble dance at the Rivoli a few weeks This latest deal by the director of the Rivoli, Rialto and Criterion is part of his plan to make the news weekly a more and more important part of his program. A weekly cartoon by Marcus, on important subjects, is one of the innovations that has become a fixture. 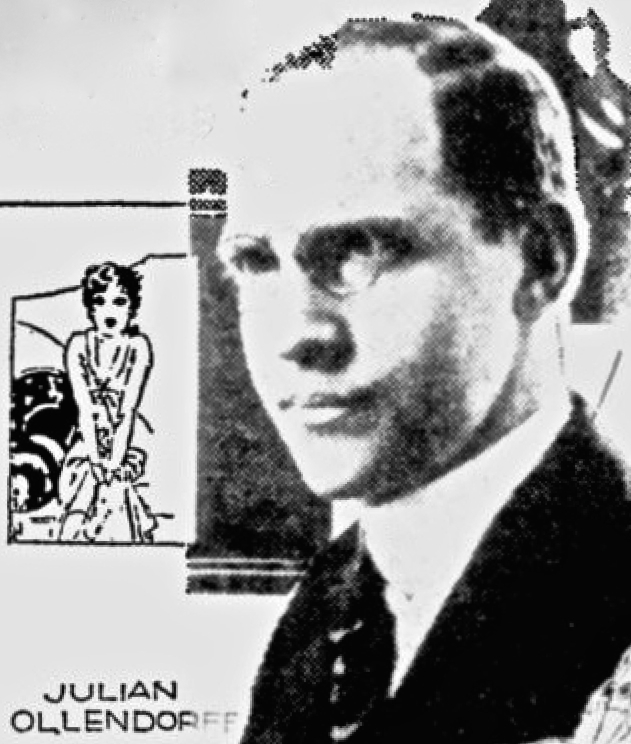 Ollendorff’s Sketchografs films were reported in many publications including the New York Tribune, July 31, 1921 and Brooklyn Life, August 6, 1921 (below). Educational Films Corporation will release early in August the first of a series of unique one-reel novelties called Sketchografs. Each will tell a story in sketches, the moving pictures showing the actual drawing of the pictures. Julian Ollendorff, the producer and artist, manipulates a motion picture camera with his left hand while he draws the sketches with his right hand. “Play Ball!” is the first Sketchograf of the series. It tells the story, in humorous sketches, of the development of ball playing from the earliest days of the national pastime, based on a thorough study of the history of the game made by Mr. Ollendorff. “Eve’s Leaves” will be another Sketchograf to be released soon. In this picture Mr. Ollendorff presents the various developments in women’s styles, beginning with the well-known costume reported to have been worn in Eden. Sketchografs were included in the Educational Film Exchanges, Inc. advertisement in the Saturday Evening Post, March 18, 1922. Ollendorff translated Sketchografs into print. American Newspaper Comics said the series began July 3, 1928. Following Sketchografs, which ended in 1929, was Gloria for the Associated Press which launched a number of strips and panels on March 17, 1930. Editor & Publisher, February 8, 1930, announced the lineup. The Sarasota Herald (Florida) carried the comics and cartoons. This strip was primarily based upon my experience in the production of motion pictures, fictionalized and added to from my own imagination. Ollendorff sued a number of businesses and people who produced the radio program, Molly of the Movies. The case can be read here. Ollendorff’s last series was American Heroes for the U.S. Treasury Department. The panel ran in 1944 and 1945. The exact date of Ollendorff’s passing is not known. The Florida Death Index at Ancestry.com has a Julian Ollendorff who passed away in 1952 in Dade County, Florida. Ollendorff’s filmography is here. Julian Ollendorff had a real gift for pen-and-ink, and an eye for beauty. Sadly for us comic strip fans, though, for much of his career he seemed to view newspaper work as an undesirable fallback position. From 1902, the date of his first short-run newspaper strip, to his last series beginning on January 22 1934, Olly of the Movies, Ollendorff spent the lion's share of his time on just about anything but newspaper strips (more about that tomorrow in Alex Jay's Ink-Slinger Profile). By 1934, Ollendorff must have been hankering to settle down a bit, and he put a lot of effort into Olly of the Movies. The strip started out with sumptuous drawing (first two weeks shown above), though as time went on Ollendorff found it necessary to tone it down some for the sake of keeping on schedule. The writing, not generally Ollendorff's strong suit, was better than typical for him, and the subject was right in his wheelhouse, a story of a beautiful young Hollywood starlet. Ollendorff knew Hollywood from the inside due to previous film projects, and the marketing for Olly of the Movies made the most of that. Readers were wooed with the idea that he would show how movies were made and how the Hollywood machine worked. Of course, as it came to be, Olly of the Movies was much more fanciful than factual, but I imagine the marketing gimmick did help to sign on a few newspapers. Ollendorff's artwork gradually turned from superb to merely adequate over the run of the strip. Whether that explains the precipitous drop in newspaper clients is unknown, but by 1937, when the strip moved from McNaught Syndicate to the less prestigious Consolidated News Features, finding it in a newspaper became like looking for a needle in a haystack. Things really hit rock bottom a year later, when the strip was picked up by hole-in-the-wall outfit Associated Features.Though Ollendorf was now working for a syndicate that was far beneath his stature, he doggedly kept on, though his dedication to the work declined once again. The New York Sun, which was no longer a major player in the New York press wars, was still subscribing to the strip, and was probably the only well-paying client. Against all odds, the Sun kept running the strip for years, finally tiring of it sometime in January or February of 1946 (the microfilm is incomplete). Presumably with the loss of the Sun, Ollendorff finally waved the white flag, and retired Olly of the Movies. The Grand Comic Book Database says it began in issue six and ran through issue 65, then spottily to issue #131. En México el comic (historieta) fue publicada en la revista Pepin, junto con otras más como Popeye y Anita la Huerfanita, entre los años 1936 y 1939, se llamaba Olly la del cine. Something to keep in mind with Famous Funnies reprints, the comic strips are heavily edited; often with panels not reprinted; heavily cropped; coloring losing art details, and dialogue completely rewritten to be simplified. Olly was no exception to this. The loss of newspapers has been pretty clear in trying to identify strips using the online newspaper databases. I've had some luck in identifying some of the dates of some of the strips for a couple of Olly's reprints in the Grand Comics Database, but some I have no clue on. Munson Paddock was born in Racine, Wisconsin, on January 22, 1886, according to his World War II draft card. A family tree at Ancestry.com said his middle name was Leroy. The middle name and its initial were never used in the census and military records. In the 1900 U.S. Federal Census, Paddock was the oldest of four children. His mother, Isabella, was the head of the household. The family resided in Salem, Kenosha County, Wisconsin. His father, Munson, a lawyer, passed away February 8, 1900, four months before the census enumeration. (An obituary was published on page five of the Chicago Tribune, February 9, 1900.) The family tree said Paddock’s paternal grandmother was Martha Cecilia Munson who was married to Francis Paddock. Paddock and his father got their first name from her. According to Who’s Who of American Comic Books 1928–1999 Paddock used several pen names including Cecelia Munson and Cecilia Munson. Some information about Paddock comes from the Lake Forest College Library Archives and Special Collections which used as its source, Munson Paddock — A Life by Jim Vadeboncoeur, Jr. The 1903 Kenosha city directory listed Paddock as a student residing at 611 Prairie Avenue. The ’03 Kenosha High School History and Annual said Paddock, class of 1904, was president of the Castalian Society. Paddock moved to Chicago. He participated in the Newspaper Cartoonists’ and Artists’ Association annual exhibits of 1905 and 1906 at the Art Institute. Vadeboncoeur said Paddock had a 1906 address at the Chicago Daily News. Soon, Paddock relocated to New York City where he drew a handful of comic strips. 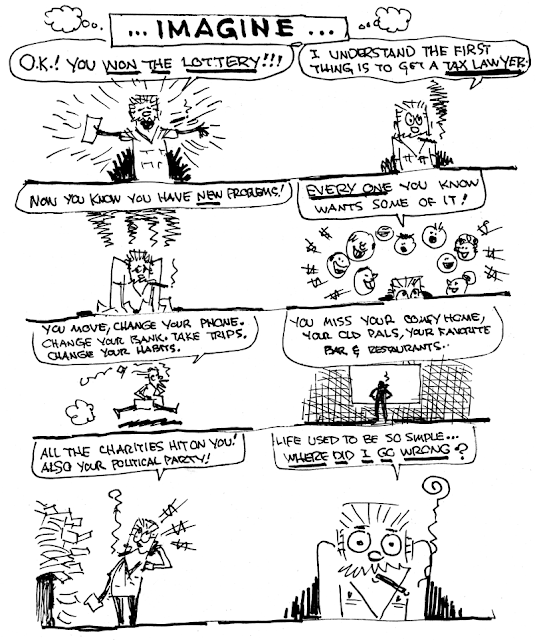 American Newspaper Comics (2012) said Paddock’s first comic strip was Mr. Bluff which began October 26, 1907. Following it were Wisdom of Wiseheimer, debuting November 9, 1907, and Little Miss Thoughtful, starting February 8, 1908. All were for the New York Evening Telegram. For the New York Herald, Paddock produced Angelic Angelina which first appeared March 22, 1908. (Publishers’ Weekly, January 29, 1910, said Angelina was issued as a publication.) 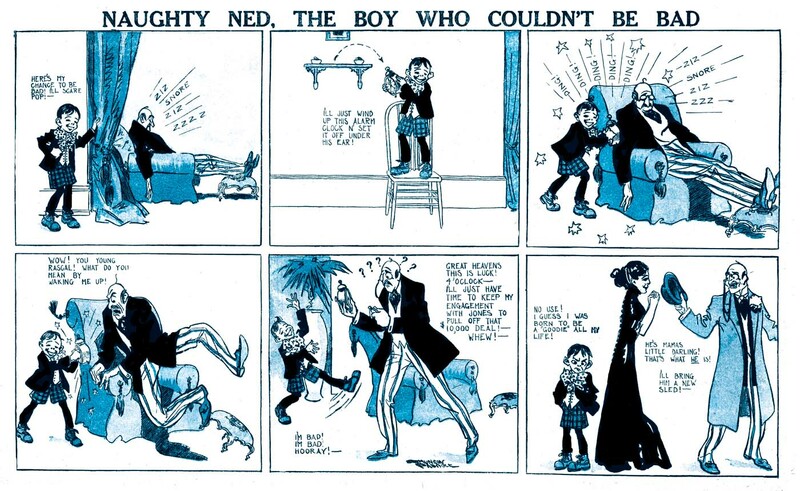 Paddock’s last strip was Naughty Ned, running from April 4 to June 20, 1909, for the North American Syndicate. Paddock was a contributor to several periodicals including Sis Hopkin’s Own Book and Magazine of Fun, Judge’s Library and Leslie’s Illustrated Weekly. According to the 1910 census, freelance artist Paddock was in Manhattan, New York City at 466 West 23rd Street. A 1912 New York City directory said Paddock was a designer whose residence was 406 West 44th Street. The New York, New York, Marriage Index at Ancestry.com said Paddock married Marguerite Noble on April 14, 1917 in Manhattan. Paddock named her as his nearest relative on his World War I draft card which he signed September 23, 1918. The couple lived in Manhattan at 112 West 11th Street, top apartment. On the occupation line was written: “Commercial Draftsman (Mail Order) Free Lance— 31 Union Sq N.Y.C. N.Y.” Paddock’s description was tall, medium build with blue eyes and dark brown hair. R. L. Polk & Co.’s 1918–19 Trow New York Copartnership and Corporation Directory, Boroughs of Manhattan and Bronx had this listing: “Paddoch-Horton Studios (RTN) (Munson Paddock & Аlbert Horton). 41 Union sq W R1101”. Paddock’s address did not change in the 1920 census. He was a freelance commercial artist. The 1930 census listed Paddock, but not his wife, in Manhattan at 320 East 42nd Street. His occupation was freelance advertising artist. The New York Times, April 14, 1931, noted the following business lease: “Harry Michaels and Munson Paddock, commercial artists, in 100 West Forty-second Street”. Who’s Who said Paddock contributed to several comic books beginning in the mid-1930s. He also worked at a few comic art studios. Some of Paddock’s comic book credits and pen names are here. A Mars Mason story is here. According to Who’s Who, some of Paddock’s pen names were used by some publishers as house names. Other artists may have been credited with one of Paddock’s pen names. Paddock was mistaken to be a woman named “Cecilia Paddock Munson” in A Century of Women Cartoonists (1993; see pages 62 and 70) and The Great Women Cartoonists (2001; pages 55 and 63). The mistake was repeated in the Animation Journal, Volume 2, 1993, Art in Motion: Animation Aesthetics (1998) and Comics Through Time: A History of Icons, Idols, and Ideas (2014). Paddock has not yet been found in the 1940 census. He signed his World War II draft card on April 25, 1942, and resided with Verona, presumably his wife or relative. (His younger sister was Ramona.) They lived at 301 Lilac Lane in Carlstadt, New Jersey. Fifty-six year old Paddock was unemployed. A Pennsylvania death certificate said Paddock’s first wife passed away February 1, 1949 in Athens, Pennsylvania. Paddock passed away January 1970 according to Vadeboncoeur who said Paddock “was an illustrator, a commercial artist, a photographer, a collector of railroad photographs and memorabilia and an artist in the earliest comic books.” The family tree said Paddock died in 1971. The Paddock Collection is detailed here. The Paddock facebook page is here. His surname was misspelled "Paddick" and his first name is exceptionally difficult to read if you don't know what you're looking at (Ancestry.com transcribes it as "Theresson"). Not much new information (I only found it because he was already at Lilac Street), just that he was living alone. When I was prepping Naughty Ned to become an Obscurity of the Day, I thought I'd just be commenting on the interesting little switcheroo this strip plays on that boring old comic strip mainstay, the rotten little prank-pulling brat. In Naughty Ned, y'see, the kid wants desperately to be a nasty li'l bugger, but just can't seem to pull it off properly. Talk about an underachiever! I was going to talk about that, but then I idly typed the creator's name into Google, and things got more interesting. Turns out that Munson Paddock, the creator of Naughty Ned and a short list of other okay but not greatly memorable strips of the late 1900s, has a bit of a fan club among the Golden Age comic book enthusiasts. Seems that Paddock was still cartooning 30-some years later, and his comic book work, especially the sci-fi stuff, has attracted interest. Well, that's kind of neat, but then I find, if we are to believe these websites, that Paddock went by a laundry list of aliases as well. One of the sites, in fact, claims that Paddock was a woman -- Cecelia Munson Paddock. That seems to be a minority opinion, but another of the cited aliases also perked up my ears. Supposedly Walter Frehm, aka Walter Frame, is also a pseudonym of Mr. or Ms. Munson Paddock. Well, now hold on just a gosh darn second. I think Mr. Frehm, who was a member in good standing of the NCS, would like to keep his status as a real person. Given all this hyperbolic biographing of Munson Paddock, I think I'll go back to stating what I do know. And that ain't much. But I can tell you that Mr. or Ms. Paddock's Naughty Ned, which is the only strip series s/he did for the Philadelphia North American, ran from March 4 to June 20 1909. That's my story, and I'm sticking to it. For what it's worth, there's a Munson Paddock, occupation artist, living in Manhattan in the 1910 census, according to ancestry.com. Born January 22, 1886 in Racine, Wisconsin The 1920 census lists him still as living in New York, and married to Margurite Paddock. I also seem him in the 1930 census, but without the wife. His 1942 draft card has him living in Bergen, New Jersey, and unemployed. I should note, by the way, that there's also a Social Security record for him, indicating he was living as late as June, 1963. Sorry for the serial comments: The World War I draft card lists him as married to Margurite, and lists him as a free lance commercial draughtsman. Blue eyes, brown hair, tall and of medium build, as of 1918. A public tree on ancestry.com has him dying in 1971, no place listed. New problems, but I could deal with them. PS - You'd get a piece of my action, Jim!